From planning and design to implementation QMC can deliver a thermal submeter system specific for your project requirements. QMC’s thermal meter systems are used for key load management or residential heating/cooling applications. We provide stand-alone meters or complete metering systems; flow meters, temperature sensors, and thermal calculators, along with any necessary connection pieces. Once installed, your submeter system will deliver actionable insights for analysis and reporting. QMC is a leader in turn-key submetering solutions for Canada’s leading developers and property managers. 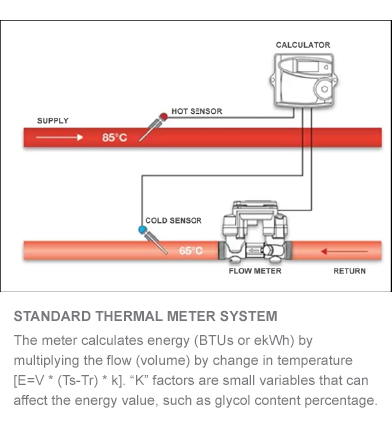 Click here for QMC’s Thermal Energy Submetering Guide. QMC has proven expertise in the design and implementation of thermal submetering solutions that enable cost recovery and conservation efforts. The management of thermal energy (cooling and heating) in a building is accomplished through submetering. With submeters on each floor or for each tenant, building owners can determine where energy is being consumed and pass along costs or work to reduce consumption. In addition, thermal energy submeters meet all relevant international regulations and best practices and are most likely to comply with future Measurement Canada regulations. The design and implementation of a thermal energy metering solution requires specialized expertise, and equipment. QMC’s White Paper “Thermal Energy Metering: Regulations and Best practices for the Canadian Market” provides an examination and explanation of the issues for the effective measurement of thermal energy. Scope: Multi-residential condo and rental complex. System design and supply by QMC including submetering for central heating/cooling plant and for individual suite heating and cooling. Scope: 467 unit multi-residential condo tower. Submetering for thermal heating and cooling on M-Bus communication system. System design and supply by QMC. Scope: 620 unit multi-residential condo development in two high rise towers. 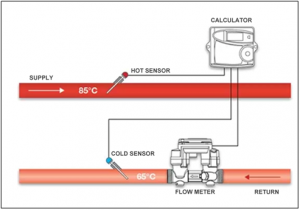 Submetering for thermal heating, cooling domestic hot and cold water on M-Bus communication system. Installation system supply and design by QMC. Scope: Mixed use tower (Residential, Office, Retail, Commercial). Thermal submetering for heating and cooling for major user group consumption. System supply and design by QMC. In Canada, energy conscious communities are expanding their use of thermal energy systems for heating and cooling buildings. One challenge these systems face is the ability to effectively measure and bill thermal energy consumption to end users, such as condominiums, apartments, and commercial units. If you’d like to know more about thermal energy, here are a list of resources.